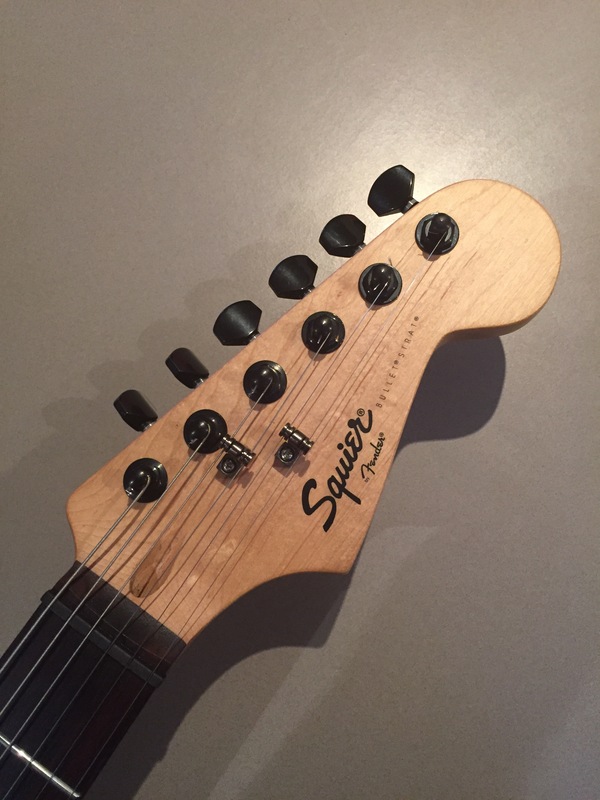 As talked about in my posts about my Squier Bullet Strat project, I wanted to find some decent budget locking tuners that functioned favourably when compared to the major players. After a bit of research I decided to try some Jinho Locking Tuners. Jinho are used as OEM suppliers for several guitar manufacturers, and the general consensus was that they were solid units. I found some for sale on eBay and got to installing them on the Bullet Strat. 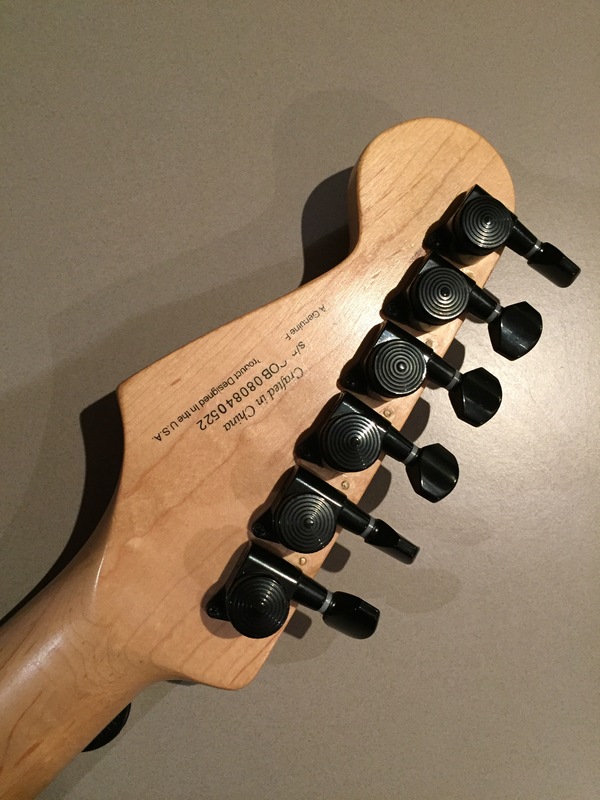 On first inspection, the Jinho locking tuners look very similar to Gotoh or other similar modern design tuner. The turning ratio is 19:1, which is better than some of the established players. The Jinho locking tuner uses a standard locking thumb wheel design, which is also found on many other locking tuners. The tuning post diameter is 10mm, consistent with most other modern designs too. The Bullet Strat has been upgraded with a Graphtech Black TUSQ XL nut, roller string trees, and a Wilkinson vintage style Strat bridge, loaded with Hantug Custom Guitars brass modern strat style saddles. Stringing up the guitar, the locking thumb wheels were nice and smooth to operate, and the 19:1 turning ratio made fine tuning each string a breeze. Once the strings were stretched I started testing out how well the guitar stayed in tune. Non-locking strat style bridges aren’t always the greatest with regards to tuning stability, and with the stock tuners, the Bullet Strat didn’t always hold it’s tune too well. With the Jinho locking tuners the tuning held up well with some heavy string bending, and things were still pretty solid after some dive-bombs and heavy vibrato with the whammy bar. I also tested the guitar on stage with my band, and I barely had to adjust tuning throughout the half-hour set of combined rhythm and lead playing. Compared to my number one Strat, which is loaded with Gotoh Magnum-lock tuners, and is similarly equipped with a Graphtech Black TUSQ XL nut, and Hantug Custom Guitars vintage style strat bridge, the Jinho locking tuners performed just as well in it’s duties, which is admirable for a set of tuners that cost around half the price of the established brand. The only real downside to the Jinho tuners is that the plating doesn’t appear to be quite as robust as the Gotoh’s, for example. The thumb wheels were bumped a couple of times during installation, and the finish was chipped. Not a major issue, and considering how well the actual performance of the tuners were, it’s definitely not a show-stopper. Overall, the Jinho JN-07SP Locking Tuners proved to be an excellent upgrade for the budget conscious player. In fact, they were an excellent upgrade even without budget restrictions in place. The excellent turning ratio and solid locking mechanism make them the perfect choice for a guitar with a non-locking tremolo equipped guitar, whether you want to go nuts with the whammy bar or just apply some subtle vibrato. It understandable why a number of manufacturers are using these as OEM parts on their mid-range guitars. If you have a guitar that requires some help on the tuning front, and have a limited budget, then definitely have a look at these tuners.